Before the series of recent trades, it was going to be very hard to envision anything but the status quo for the Wild because of salary constraints. The flurry of Wild trades over the last month had plenty to do with shaking up a stale core of players. But they probably had as much — or more — to do with creating even a little bit of much-needed payroll flexibility for a team that has been constantly pressed up against the salary cap in recent years. Let’s take a look at how the Wild is situated heading toward the summer and beyond after the three major trades. *First, a youth movement clearly has financial benefits in terms of controllable assets — either on entry-level deals or in the case of the three players I’m about to list as restricted free agents. Let’s guess and say holdover Joel Eriksson Ek and newcomer Ryan Donato both get two-year deals worth $2 million a season as restricted free agents this summer and newcomer Kevin Fiala maybe gets a slightly longer deal at $3 million a year since he has three straight years of double-digit goals, including a 23-goal season last year. The individual numbers might shake out a little differently, but let’s go with $7 million combined for those three players in 2019-20 and 2020-21. Before the trades, the Wild was on the hook for Charlie Coyle at $3.2 million next season and unrestricted free agency the year after. Mikael Granlund was going to count $5.75 million next year and be a UFA in 2020. Nino Niederreiter has $5.25 million a year for the next three years after this one. Isolating just on next season, the Wild took back Victor Rask ($4 million a year, same length as Niederreiter) and will pay Donato and Fiala maybe $5 million combined. So they went from $14.2 committed to three players to more like $9 million. The Wild spent $3.25 million of that projected $5.2 million savings on a modest extension for Eric Staal, but that still leaves them about $2 million ahead of where they were going to be pre-moves. That puts them at about $70.3 million spent toward the cap next season (including the final year of the Tyler Ennis buyout at $1.1 million), leaving a little under $13 million more to spend under a cap projected at about $83 million. That includes 12 forwards, six defensemen and two goalies — basically most of the guys who dress now, plus Matt Dumba, Mikko Koivu and Rask back from injury. Depth/entry-level guys will eat up another few million, so let’s say the Wild sits right now with about $10 million to spend this summer — and doesn’t have to use any of that money on anything in particular since at a base level every position is accounted for after the Staal extension. Without the trades, and still with the Staal extension, that number would have been more like $5 million in cap space. Neither is a ton of room to play with, but $10 million at least gets you into the conversation with a big acquisition or two. And the Wild could carve out more room if it deals Jason Zucker ($5.5 million) before his modified no-trade clause kicks in this summer, depending on what salary it received in return. Based on what GM Paul Fenton has done already, one would expect a Zucker deal would net another NHL-ready but lower-priced asset. The bottom line is that in the short term, Fenton at least was able to carve out enough space to make the Wild relevant in free agency. Before the trades, it was going to be very hard to envision anything but the status quo because of salary constraints. *Two years from now, things get even more interesting. Had the Wild kept Granlund and Coyle, both would have been due at least modest raises as unrestricted free agents. Granlund would have figured to jump into the $7.5-8 million a year range, while Coyle maybe would bump to $4 million. You can argue about whether those players are worth that much, and that conclusion likely influenced the Wild’s decision to trade them. Letting them walk as UFAs would have yielded nothing in return. Let’s say they also still had Nino at $5.25 million. Now we’re talking $17 million a year for those three guys — compared to the $9 million I’m projecting for the players the Wild got in return, assuming Donato and Fiala sign modest multi-year deals as RFAs this summer. Luke Kunin and Jordan Greenway will be due modest raises as RFAs in the summer of 2020 assuming they continue to play meaningful roles, while two expensive players will be unrestricted free agents: defenseman Jared Spurgeon and veteran center Mikko Koivu. Koivu will be 37 that summer and will be an interesting decision. Spurgeon is a no-brainer for an extension. Regardless, Fenton should still have some flexibility that summer as well — maybe another $10-15 million under the cap depending on what happens this summer, what happens with Koivu and how much the cap goes up. Don’t forget, that’s the summer the Wild could also add prized prospect Kirill Kaprizov. *Whether that translates into success — the ability, at least, to remake the Wild on the fly instead of full-on rebuild — will depend in large part on how well those “controllable assets” perform. Granlund, Coyle, Niederreiter and other similar Wild players who came of age at the same time delivered good value as young players but collectively didn’t make a big enough jump to match their bumps in salary. They were also bolstered by high-priced veterans in their primes (at the time) like Zach Parise, Ryan Suter and Koivu. Parise and Suter have six years left each on their deals after this one, counting a combined $15 million against the Wild cap each year. They’re still good players and should be for some years to come — given that both have full no-move clauses, the Wild better hope for as much — but the aging curve suggests they won’t have the same impact in the back half of their contracts as they did in the front. But the Wild is at least positioned to add other impact free agents in years to come. That wasn’t as possible just a month ago. That said, Donato, Fiala, Eriksson Ek, Greenway and Kunin (plus eventually Kaprizov and others) are the next wave. However far above or below expectations (and salary level) they achieve will probably tell the story of the Wild in the next 3-5 years. 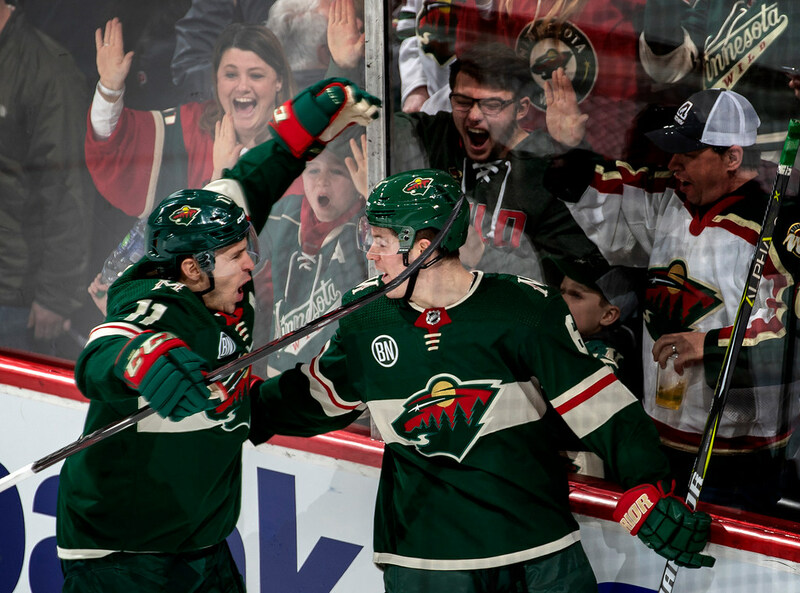 Will youth and speed be enough to conquer Wild's stale history?